The Kurds are the largest people group without their own homeland. They are spread across Turkey, Iran, Iraq, Lebanon, Armenia, and Georgia. This oil-rich area is known as Kurdistan. The Kurds of Armenia originated in Turkey. Large numbers of Kurds immigrated to Armenia and Georgia in the late 1800s and early 1900s. Some of them are Yazidis (a sect of Islam) who were fleeing persecution as heretics in the Turkish Ottoman Empire. Though the distinct Kurdish communities within the C.I.S. 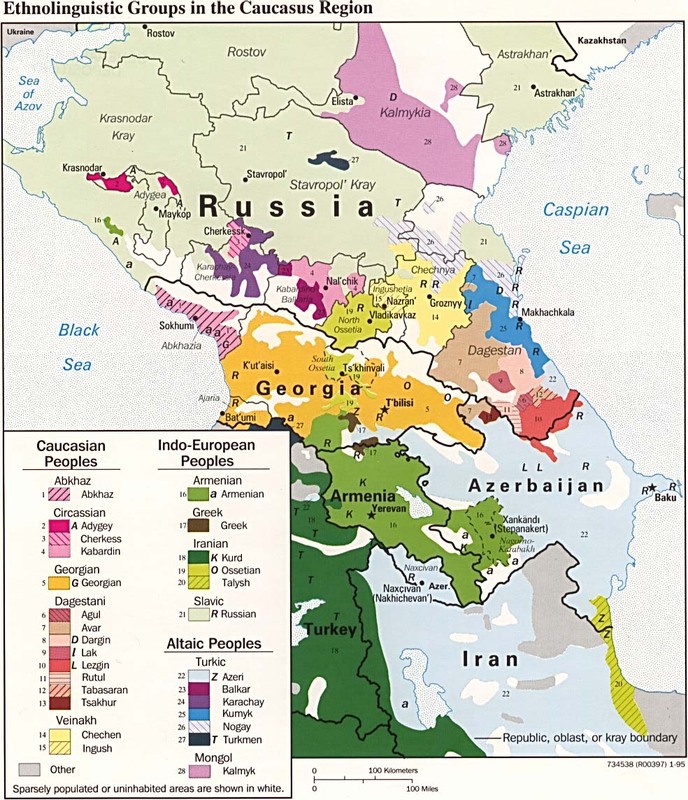 (former USSR) are separated by religion, places of origin, and distance, many Kurds still dream of a united Kurdistan. Customs and traditional dress have been maintained in many areas. The C.I.S. encourages the Kurds to use their national language, and Armenia has become a cultural center for Kurds. There are radio broadcasts in the Kurmanji dialect and there is a Kurdish publishing house. The Kurds of Armenia enjoy a higher standard of living than their cousins in Turkey and Iran. Although they still farm and care for animals, many now live in cities. About half live in Armenia's capital city, Erivan. While the Kurds in Turkey are relatively poor, former Soviet Kurds are among the nation's most prosperous citizens. They work hard on the various collective farms, as well as tending to their own herds and plots of land. The prosperity of the Kurds is evident in the quality of their homes. They have modern houses made of stone or brick, usually equipped with central heating and sometimes even a telephone. Their villages have broad, well-lit streets, linked to the cities by reasonably good roads. They have their own schools, school books, and a printing press, as well as many other things that are considered luxurious in Kurdistan. They face no discrimination and many hold high political offices. Illiteracy disappeared among them in the 1930s. Prior to glasnost, there was a measure of cultural freedom for the Kurds. However, both glasnost and Armenia's independence have contributed to a resurgence of Kurdish identity and expression. As Kurdish nationalism has been re-awakened, many C.I.S. citizens have embraced their ethnic origins by declaring themselves to be Kurds. Though the Kurdish Yazidis of Armenia are small in number, they have done the most to defend their identity. They have jealously guarded their national customs and have resisted the pressure to be absorbed into the Armenian lifestyle. The Kurds are noted for their elaborate and colorful national costumes. The men's attire consists of baggy, colored trousers and plain shirts with huge sleeves split at the wrist and tied at the elbow. Brilliantly colored vests and sashes are also worn. Women wear brightly embroidered, heavy clothing. While most of the Kurds of Armenia are Shia Muslims, a significant number are Yazidis. Their beliefs draw heavily on the ancient Persian religion of Zoroastrinism. Zoroastrinists worship a god named Ormazd. They believe that there is a universal struggle between darkness and light. Traditional Muslim Kurds have long persecuted the Yazidis, whom they view as heretics. The Kurds of Armenia have followed Islam and Zoroastrinism for many years. Although they are financially prosperous, spiritually they are paupers. Although the New Testament and the Jesus film are available in their language, there are still only a few known believers among them. * Ask the Lord to call people who are willing to go to Armenia and share Christ with the Kurds. * Ask the Holy Spirit to soften the hearts of the Muslim Kurds towards Christianity. * Pray that God will raise up Armenian Christians as a clear Gospel witness to the Muslim Kurds. * Ask God to strengthen, encourage, and protect the few known Kurdish Christians. * Ask the Lord to give missions agencies strategies for reaching the Kurdish population. 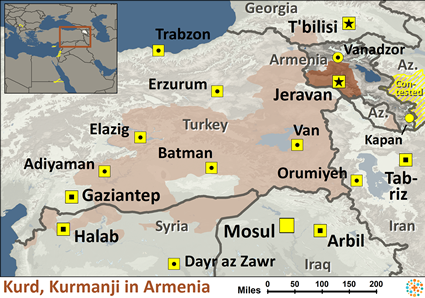 * Pray that a strong local church will be raised up among the Kurds of Armenia.View Kurd, Kurmanji in all countries. Location in Country: Aragatsotn province: Talin town; Ararat Province: Artashat and Masis towns; Armavir province: Echmiadzin; Geghark’unik’ province: southeastern coast, Lake Sevan; Kotayk’ province: Abovian area; Shirak and Lorri provinces; other main towns and cities.